It’s not what you think — I’m so not one of those totally basic women with a passion for learning about underrated mid-sized cities in so-called “flyover” states. No, I was specifically obsessed with Columbus, because it would soon become my home — and I had never even visited. So imagine my delight when my hobbies converged and I found a Columbus city guide on my favorite blog, Design*Sponge. It was written in a friendly, conversational tone, highlighted everything from contemporary art galleries to greasy spoon diners, and made me feel like this whole moving-700-miles-to-a-new-city-sight-unseen thing wasn’t so crazy, after all. I bookmarked it and returned to it often, always noticing new details to add to my growing mental map of the city I’d soon call home. At some point I took a break from my fevered Columbus research to learn more about the author of my trusty guide: Eva Jorgensen, founder of Sycamore Street Press. Clicking away from the Columbus city guide to the Sycamore Street Press website was the moment that this all changed. The delicate, artful designs and simple but thoughtful sentiments I saw as I scrolled through their cards were unlike anything I’d ever seen on a card rack. 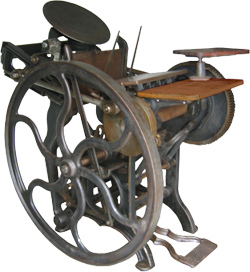 I googled “letterpress” and found myself gazing at a piece of machinery that looked so fantastically “old world,” I was shocked that humans had been smart enough to keep them around after the advent of the inkjet. The idea that Eva, the author of my trusty city guide, spent her days designing and printing things by hand, on a big piece of antique machinery… well, I couldn’t imagine a more beautiful, satisfying pursuit. It didn’t matter that a moment before I hadn’t ever heard of a letterpress, or that I knew nothing about typesetting, or lettering, or drawing, or design — I had a new line entry on my mental list of dream jobs. When I returned to the city guide, I paid new attention to one item on her list: a stationery shop called On Paper. Eva had commented “I worked here when I first moved to Columbus, and I think I’d spend most of every paycheck on all their lovely paper goods!” I couldn’t wait to see a shop that had been an inspiration to my newest creative role model. I’m getting ahead of myself; tomorrow I’ll tell you all about my love of On Paper, and the key role that it wound up playing in my creative growth. But I will say this: the first time I walked into the shop, the first card I happened to pick up was a Sycamore Street Press design. I couldn’t help but take it as a good omen. I’ve never met Eva Jorgensen, but for seven years now she has unwittingly been one of my role models. I’ve been following Sycamore Street Press ever since that fateful evening in the video store, and it’s been incredible to see how the brand has evolved and grown over the years. So Eva, if you're reading this — thank you. Back in 2010, I was grateful you were willing to share your experiences with the world, because you helped me find a home for myself in a new place. But looking back today, I can see that your talents and vision have also inspired me to find my own creative path.